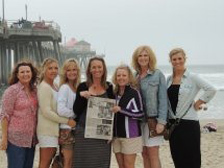 On October 24, "The Quill" traveled with to California with six friends who met up in Los Angeles, California and stayed at the home of Lisa Butler Thompsen. 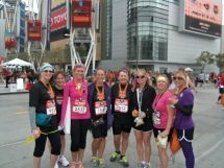 Lisa, Monica Mueller Crim, Kristin Stone Swayze, Debbie Helmers Canfield, Amy Palmer, Joan Greenig Mohr, and Morgan Mohr went to LA to visit, sight-see and run. Kristin and Monica ran in a Half- Marathon and Lisa, Amy, Joan, Morgan and Debbie ran in the Mini (a 5K) on the 27th in the Rock and Roll Marathon Series. Jill Howard Syfert also joined us on the 27th.